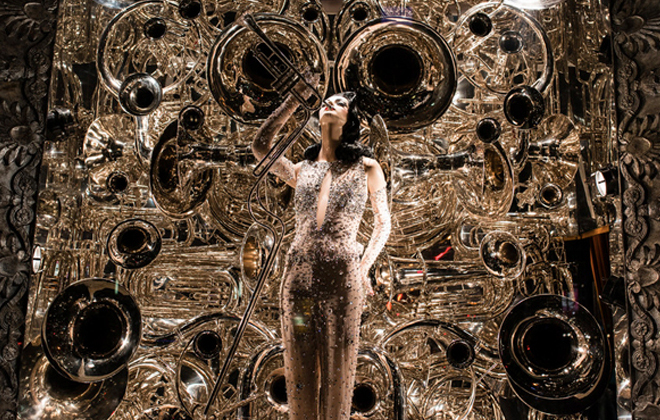 Nothing compares to the masterpieces that are created every year at Bergdorf Goodman. 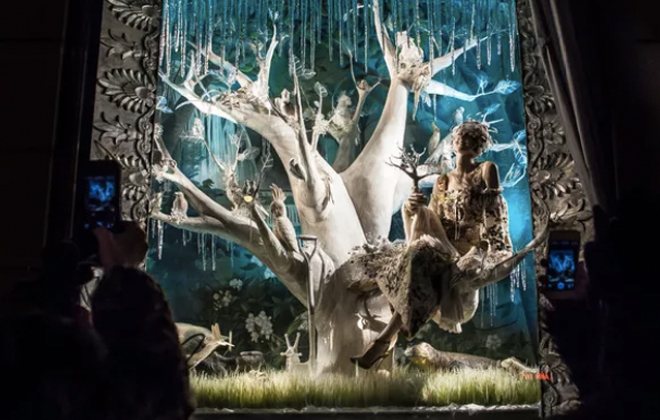 I have always be in love with the Bergdorf holiday windows, finding them to be by far the most exciting and intricately produced displays of the season, but it wasn’t until watching the documentary “Scatter my Ashes at Bergdorf’s” that I really understood the planning and craftsmanship that goes into each window. 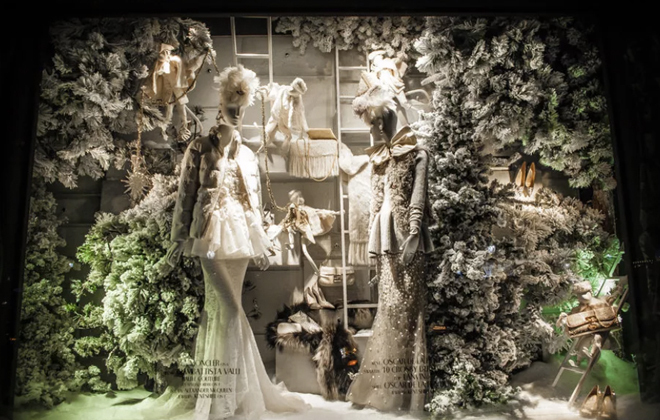 Although I wouldn’t recommend running out to watch the documentary, I did find it fascinating to get a look behind the scenes of David Hoey’s creations, who has been the Director of Visual Presentation at Bergdorf’s for over seventeen years now. He is truly a genius. Let me tell you why! 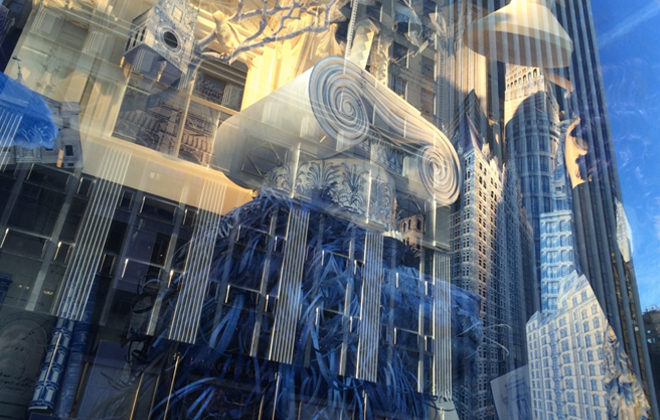 Image of 2015 windows by Max Touhey. Quick sidebar: It just so happens that one of my favourite films is the Wizard of Oz. I really love it and it feels so timeless. Why mention that? Well, in the Bergdorf documentary, it mentions a quote that caught my attention, from L. Frank Baum, who said of window dressing that one must “arouse in the observer the cupidity and longing to possess the goods, to marvel at the beauty of the display.” Baum, who is most widely known as author of “The Wizard of Oz,” sort of started the tradition of window dressing in the late 19th century, by introducing a creative flare into what was thought to be a mere necessity for most shop owners. 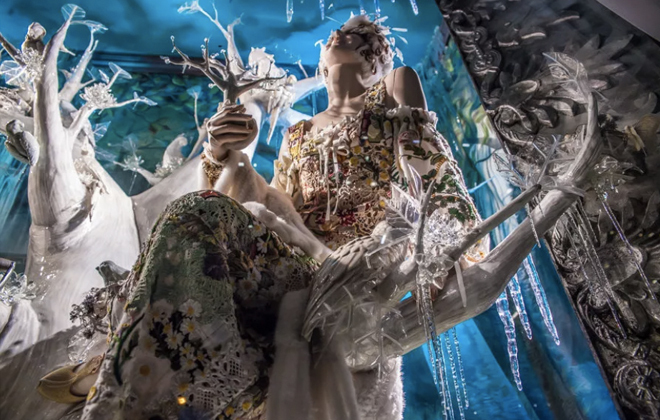 It’s within this vein of whimsy and imagination that David Hoey continues Baum’s vision, and goes above and beyond in creating that awe and longing. “We specialize in old-world craftsmanship, often creating permanent objects and props that are re-used for future displays. 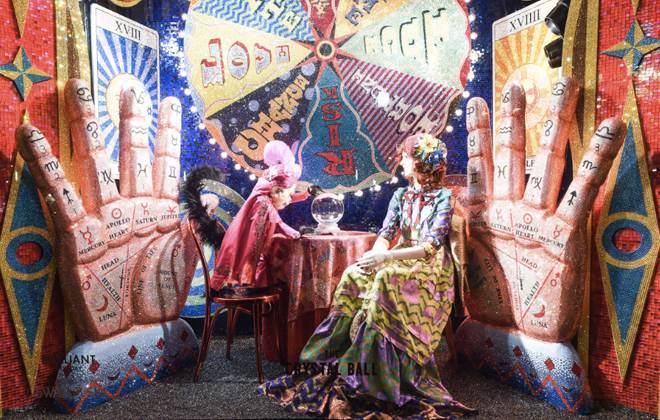 We frequently use antiques and unusual collections and curiosities as the foundation of individual windows,” Hoey says of the now iconic displays. 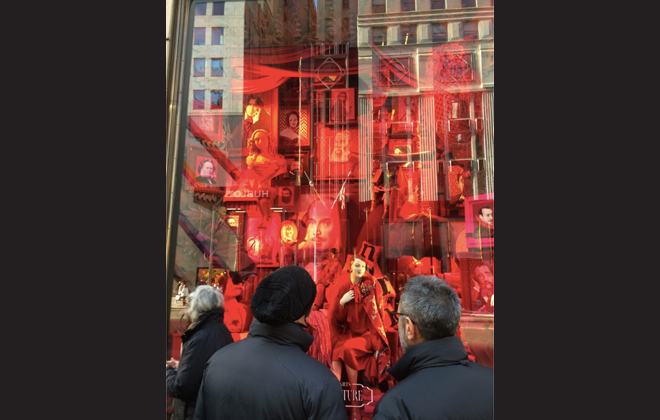 Image of the windows from 2013 by Driely S.
It is now time to talk about what it takes to pull this all off. It is no small feat! Each year, along with about a dozen long time contributing artists, Hoey leads a team of over 100 craftspeople in creating every intricate artwork that appears in the windows, utilizing a host of crafts and mediums, from hand blown glass to gold leafing; embroidery to hand cut paper sculpture; bejeweled mannequins to chrome plated structures, all coming together to create rich, opulent, dream-like scenes each year. It’s a very hands-on process, with Hoey at the creative helm finding freelancers, industrial craftsmen, and even fine artists to hand make or produce whatever fantastical object is needed for the concept. 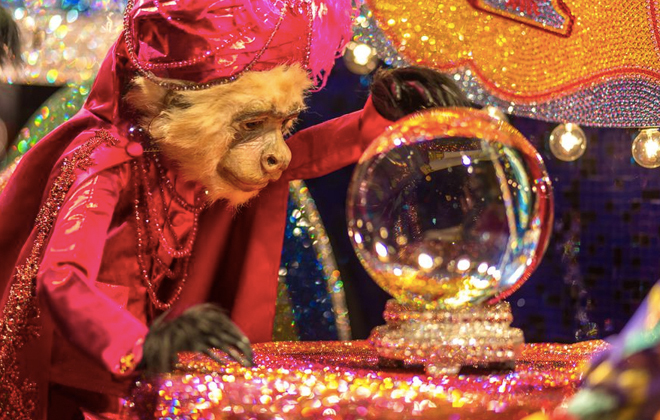 Artists and workshops from all over are enlisted to produce all the varying aspects of the displays, and many are not assembled together until the final installation, leaving open the possibility for imagination as each display comes together. This year Hoey’s vision celebrates Swarovski, as it is the 120th anniversary of the famed crystal maker. 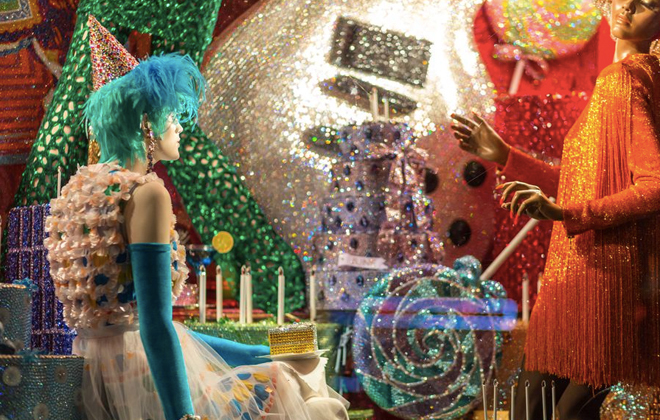 The windows dazzle and shine with the over 7 million crystals that were used to create the displays, and I tell you, each window is more beautiful and wow-inducing than the next! I am again in awe.